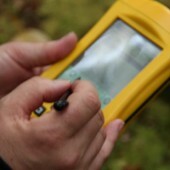 The kakapo has been pinned with many adjectives. Shy, frisky, curious and romantic are ones that crop up most often, however one that is noticeably absent from the usual list of descriptors is ‘gloriously perfumed’. The cover of darkness means that fabulously coloured plumage will go unnoticed by potential mates. So instead it smells. Great. It’s like its feathers have been dipped in a musky array of essential oils that could come straight from a Middle Eastern perfumier. And since becoming a full-time bush waitress, I’ve become rather obsessed with scouring their feeding area for stray feathers so I can cop a generous nose-full. Luke gets a health inspection and weighs in at a healthy 2.5 kilos. At 2.5 kilos, he’s big enough to boom. 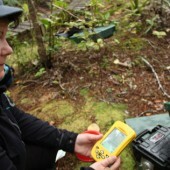 A feed-out volunteer, Jenny Galt, downloads data on the movements of the various kakapo in the near vicinity. 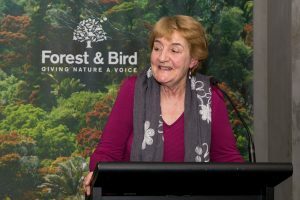 Mandy “bush waitress” – every three days volunteers replenish the food stations of key kakapo on the island. 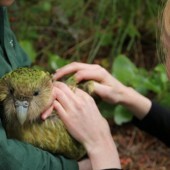 I’m here for two weeks to feed many of the females (and a handful of males) on Codfish island (Whenua Hou) – the epicentre of operation save kakapo – to encourage this critically endangered parrot to breed. Engorge these would-be mothers with food, and you’ll end up with males, lighten the servings and there’s a good chance you’ll have a lot of females on your hands. It’s a rather ingenious method of keeping the population stemmed at a time when food is scarce. This year, team kakapo is hoping for a new swag of females, so they’re easing back on the supplementary food portions. The pellet mix is nutritionally similar to the rimu fruit – which is one of the mystical plants that helps them to breed. These supersized parrots are true gourmands and they’ll travel great distances in one night just to snack on a certain plant or fruit (and sometimes climb 30 metres to reach it), so it’s not surprising that their breeding success is tied to a key fruiting tree. 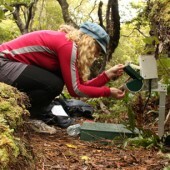 Over the past 15 years scientists have tried to manipulate the fruiting cycle of the rimu and some have boldly suggested that a top dressing of hormones could boost fruiting, however these big ideas haven’t come to much, so instead the team relies on a dazzling array of equipment to record mating occurrences (and their quality & length), video-monitor chicks and pinpoint kakapo at night using infra-red technology. 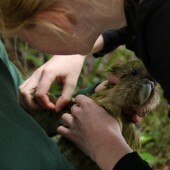 Kakapo were rescued in the nick of time when in 1977, Wildlife Service staff searched Fiordland and discovered 17 males living in the upper reaches of the mountains away from the reach of stoats. In the same year, a 200 strong population of kakapo were found on Stewart island. However feral cats had got a taste for kakapo and this population was riding the bow wave of extinction, something that was played out in the 1980s. 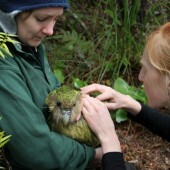 Operation ‘Save kakapo’ was further hindered by the lack of experience of the Wildlife service staff who knew little about the diet and habits of this biological oddity, and depressingly every single kakapo rescued from Fiordland died in captivity. Save for one – Richard Henry. This genetically valuable bird, like many of his vintage, passed away two years ago but he sired two sons and one daughter and it’s hoped this year these teenage kakapo may produce chicks of their own which will help to reduce the genetic bottleneck. Although this year isn’t shaping up to be a spectacular fruiting season, the 4-strong DOC team on the island work from daybreak into the night to ensure that there will be a few more kakapo to prop up the team. At present, the count lies at 125 individuals. Luckily for me, I got to clap eyes on a kakapo on my first day. Ruth (all kakapo are named) came purposefully gambolling towards me as we replenished her feed station, however as soon as we locked eyes she took a sideways leap into the bush. A second sighting maybe unlikely, so I am hoping the males will jump- start the breeding season, so I can hear them booming. To attract mates, the male kakapo performs an elaborate ritual. They’ll find the highest point, make a track to parade along, and a bowl, then they’ll sit in this small resonance chamber, fill their thoracic sac, swell to the size of a football and let out an almighty fog-horn style Oooom! Oooom! Oooom!. If all goes well, the ladies will flock, and then he’ll treat her to a whirling dervish style dance. Staff here says this begins at around early December, so if everything falls into place my dreams maybe set to this wild bush music. Needless to say, the males finish the breeding season half starved, so staff then switch their attentions to these exhausted romantics. For now though all attention is placed on feeding the precious few females – some of whom have feeding stations that only open when they’re present to prevent avian raiders such as kaka and other kakapo stealing their food. Now, I’m on my 6th day and the initial days of utter exhaustion, blister-filled feet and dazed evenings spent mechanically spooning soup into my mouth are a distant memory. I can knock off my round in 5-6 hours and although I’ve yet to venture to some of the more terrifying tracks on my map – durkadurkastan, horror and wounded knee – I’m sure they must be dotted with fragrant kakapo feathers. Returning to the hut though is perhaps my favourite part of the day. My desk-jockey body returns weary, spent and every so often I receive a small thrill with the thought that my role as a grunt may have helped – in a minuscule way – to nudge this incredible, eccentric species further away from extinction.